Bonn, Germany (November 22, 2017) — The milestone moment by member countries of the Kyoto Protocol in deciding that the Adaptation Fund ‘shall serve the Paris Agreement’ near the conclusion of the two-week UN COP 23 Climate Conference in Bonn on Friday followed a successful final few days at the conference, in which the Fund received a record amount of new funding pledges and commemorated 10 years of operations in helping the most vulnerable communities in developing countries adapt to climate change. The decision related to the landmark Paris Agreement was particularly fitting in that it occurred a day after the Adaptation Fund celebrated the 10th Anniversary of the launching of its operations with a special event at the historic Old Town Hall in the center of Bonn on November 16. In the preceding days during the Bonn conference, the Fund also exceeded its US$ 80 million resource mobilization goal for 2017 as Germany (EUR 50 million), Sweden (SEK 185 million), Italy (EUR 7 million), the Walloon Region of Belgium (EUR 4 million), and first-time Adaptation Fund contributor Ireland (EUR 300,000) came forward to announce new pledges for the Fund. It is worth noting that several pledge amounts increased from previous years. Last year, for example, Sweden contributed SEK 100 million to the Fund while both Wallonia (EUR 1 million in 2015 and EUR 3.5 million last year) and Italy (EUR 2 million in 2015 and EUR 5 million last year) have steadily raised their contributions. And with Germany’s latest contribution, it has now contributed EUR 240 million to the Fund. Ms. Isabella Lövin, Deputy Prime Minister and Minister for International Development Cooperation and Climate of Sweden, praised the Fund’s concrete adaptation actions to the most vulnerable, its Direct Access modality in building countries’ adaptation capacities and its policies promoting gender equality and mainstreaming, during a November 15 Contributor Dialogue organized by the Fund. In announcing Sweden’s pledge, she said Sweden’s goal was to make the Fund an integral part of the Paris Agreement. “Recent extreme weather events have once again reminded us that climate change is here right now. We hope that this pledge of support shows that Sweden stands in solidarity with those most affected by climate change,” she said. Through comments conveyed by a representative at the dialogue, Fiji’s High-Level Climate Champion, Minister of Agriculture, Rural and Maritime Development and National Disaster Management Mr. Inia Seruiratu also praised the Fund for its important work to small island developing states and its overall portfolio focused on helping the most vulnerable adapt to climate change. Ireland’s pledge marked its first contribution to the Adaptation Fund. 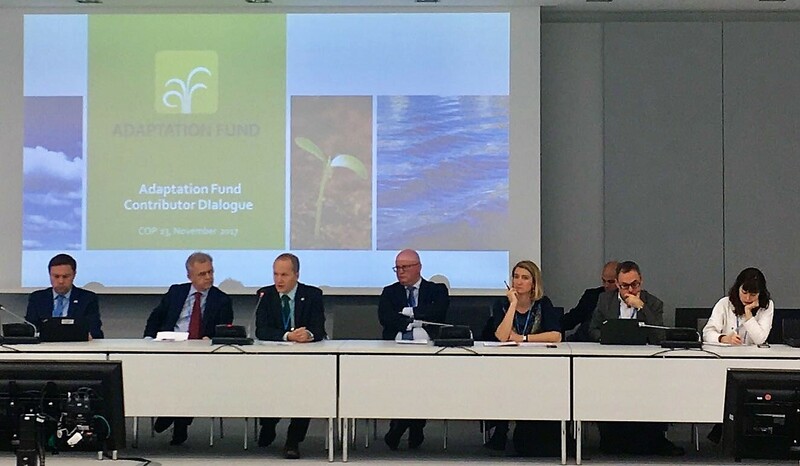 A representative speaking on behalf of Irish Environment Minister Mr. Denis Naughten said during the dialogue that adaptation is a key focus of Ireland and the Adaptation Fund is doing great work in delivering concrete projects to vulnerable countries. Ms. Naoko Ishii, Head of the Adaptation Fund Board Secretariat and CEO and Chairperson of the Global Environment Facility (GEF), said the GEF is very proud of the Adaptation Fund and how it has grown into such an effective fund for those vulnerable to climate change over the last 10 years. She said its record amount of new pledges shows the trust it has created in its work. Ambassador Ms. Janine Felson, UN Deputy Permanent Representative of Belize, said the recent rash of major hurricanes having devastating effects on very small islands has raised the necessity of adaptation in vulnerable countries as a ‘way of life’ to preserve homes and livelihoods. She said she looks forward to many more years of the Fund working for the most vulnerable. Mr. Déthié Soumaré Ndiaye, Coordinator with the Centre de Suivi Ecologique (CSE) in Senegal, the first approved national implementing entity under the Fund’s pioneering Direct Access modality that empowers countries to enhance capacity to cope with climate change, said CSE’s experiences with the Fund in building its capacity and delivering concrete projects to help vulnerable Senegalese communities adapt and become resilient to sea level rise have been ‘catalytic’ in the country’s response to climate change. City of Bonn Mayor Mr. Ashok Sridharan, who co-hosted the anniversary event as Bonn also serves as the official meeting place of the Adaptation Fund Board, said the Adaptation Fund has been instrumental in advancing adaptation to the most vulnerable over the past 10 years and ‘walks the talk’. He said cities and regions stand ready to help as global adaptation needs continue to rise. Ms. T. S. Raji Gain, Chief General Manager of the Fund’s national implementing entity for India, the National Bank for Agriculture and Rural Development (NABARD), also spoke earlier at the dialogue about the example of six India projects funded by the Adaptation Fund that are reaching vulnerable communities in diverse adaptation sectors and regions, and how NABARD’s experiences with the Fund have led it to contribute to India’s national adaptation planning and to serve as the implementing entity for India’s own National Adaptation Fund. A special anniversary publication featuring stories and visuals from Adaptation Fund projects, achievements and stakeholders was released at the event, and can be downloaded here.